There are 164 posts in this topic. You are on page 1 of 4. I thought I would share a bit about my current Space Shuttle pin that I purchased earlier this year. The machine was in a good state, outside of some lamp row/columns issues and a blown transistor. Since I am new to pinball in general, performing my own maintenance has been an educational experience. My background is in IT/electronics and I was able to grasp most electronic and mechanic processes quickly. However I am not an art person, nor am I that proficient in woodworking. 1. The ball travel across inserts was not level and cause the ball to take "weird" bounces. 2. Part of the overlay in the U-S-A rollover lanes was delaminating from itself and rippling. 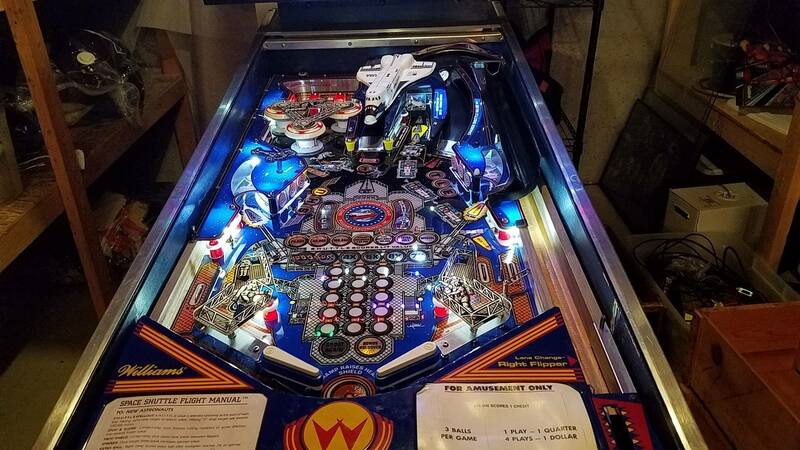 First, I looked into reproduction playfields, but they're either sold out, not available, or folks like $1,000 for one (which literally is close to the price of the entire pin)! 1. This thing is thick! 0.03" to be exact. 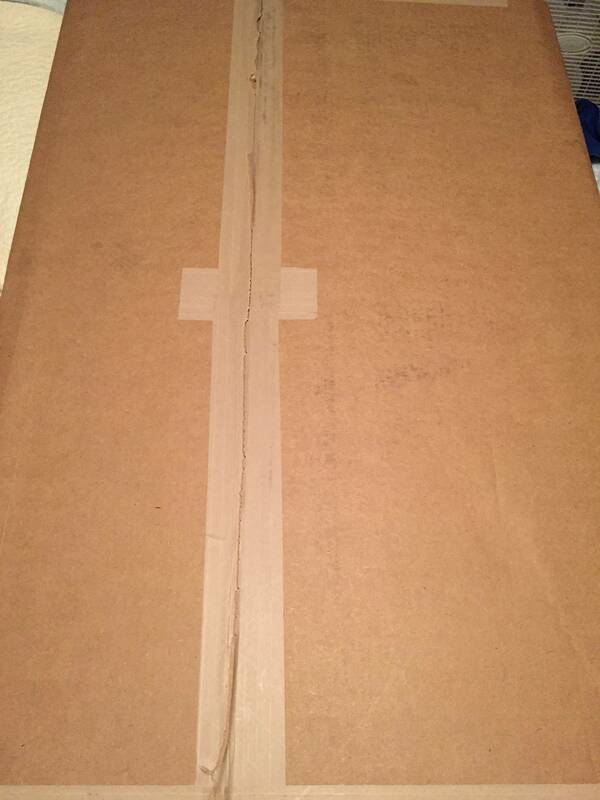 I was really surprised when it shipped to me because I assumed it was going to be rolled up in a tube, but it was flat packed to me. 2. Underneath the white protective coating, the artwork looks great. The colors all seems to match, and there doesn't seem to be any print registration issues from the screening. 3. I'm told that the adhesive is ungodly sticky, which is good, as long as you don't make a mistake. At the time of writing, I've yet to feel it's wrath. 4. Also, Outside Edge mentioned that that the ball surface is actually custom hard coated and far more scratch resistant than standard PETG. I'll have to investigate this more once the application is completed. 1. The coil for the outhole. 2. The switch on the black ramp. 3. The three pop bumpers (as usual). 1. 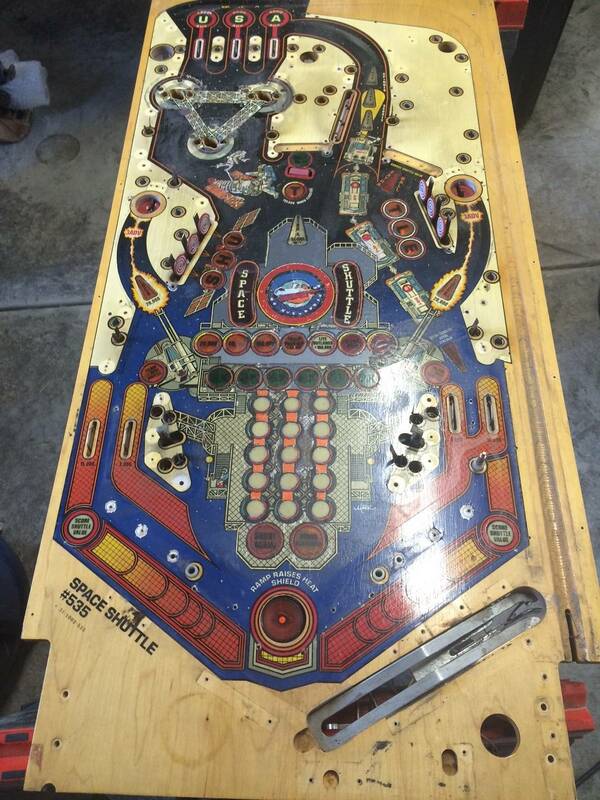 Pull out my playfield and get it prepped for sanding. 2. 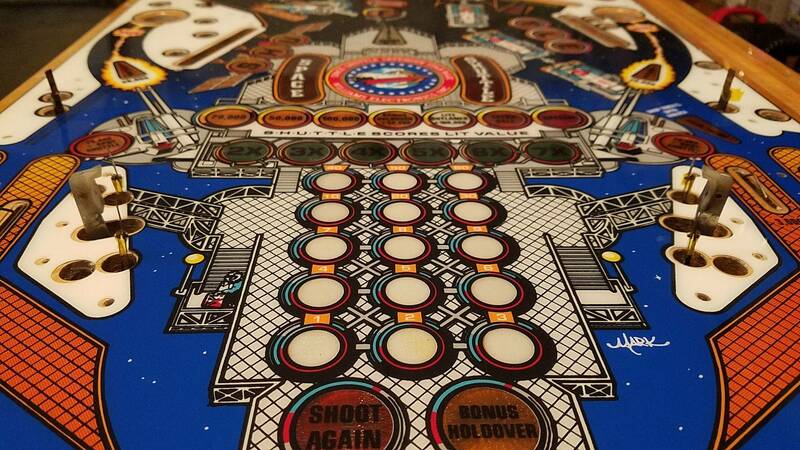 Sand smooth all of the playfield, and remove all the writing on all inserts. 3. Potentially replace both hotdog inserts if I can find a good source for them. I'm curious to see the new overlay , I have got two shuttle playfields and I might do one of them . I know it's a proton but roughly how much is one of his overlays ? Pricing is still being determined, but from what I have heard, it's going to be very affordable compared to any type of reproduction playfields. Sounds interesting, the extra hard finish sounds like it will be better than most overlays because the softness of some of them tends to make the play slow. Looks like you're doing a great job so far! 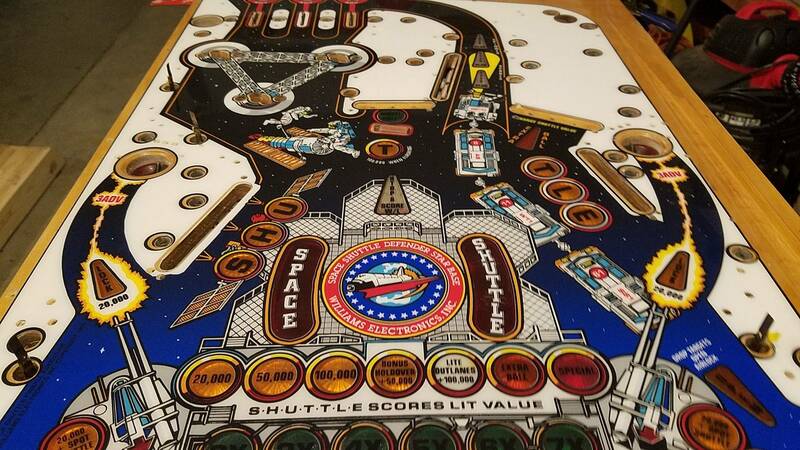 I have a nice Space Shuttle with a reprinted clearcoated playfield that plays like a rocket! Great Great game and well worth the work! I think this game was ahead of it's time as far as sounds and gameplay, just love it and with the Space Shuttle retired it's got a special place in history and that adds to the collectibility! Good luck with finishing the project, hope it goes smooth as silk! Interesting. Will there be titles besides Space Shuttle? I don't even see that overlay listed on the website (assuming there's only one Outside Edge Pinball). Interesting. Will there be titles besides Space Shuttle? Yes, I believe SS is one of their first titles, but from Outside Edge told me, he's expecting a lot of titles in the future once they collect feedback from other prototype testers. I don't even see that overlay listed on the website (assuming there's only one Outside Edge Pinball). That's the right site. It's not for up for sale yet. I'm sure Outside Edge will make a swing by this thread (as he is on PinSide). Very interested to see the product. 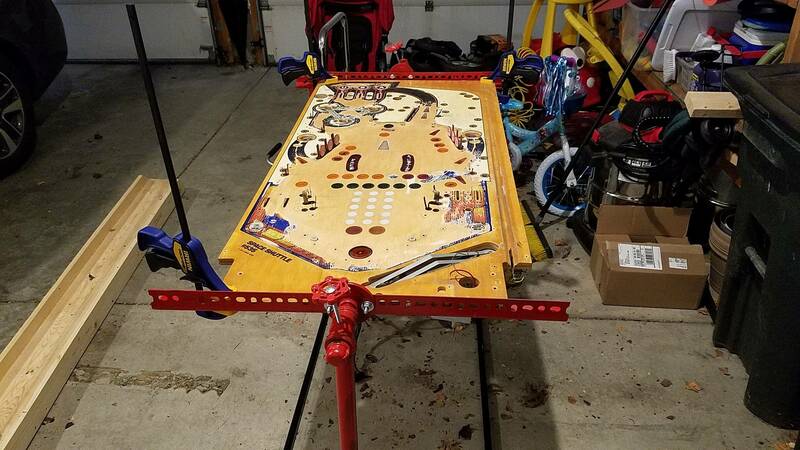 I've been looking for a way to renew my well worn playfield without spending more than the unit is worth. How do I get one? Yes, we will be tweaking this product to ultimately be "the answer" for many titles that you may NEVER see repro playfields for, as well as being a more affordable approach for folks on a budget... or someone who just wants to tackle a smaller project (than a whole new playfield) for a few titles that have been reproduced in the past. We have worked very hard to find a hard coating on the surface that would rival (or surpass) the durability of the traditionally clear coated play fields. Pricing is being determined. Titles will vary in cost based on art and overall manufacturing complexity... but think roughly 1/2 (or less in some instances) of the cost of a playfield reproduction. We are actually not calling this product an "overlay", as too many will assimilate this to what has been traditionally available. Our working name (although not official) is "The Hardtop". This product is NOT (as you see shown above) a thin, surface printed decal. Overall, we are super excited about it's potential. The hard coating is not an off the shelf hard coated material. We are having these coated via custom order using a much thicker layer of coating than is offered as a "shelf" item. The caveat is that we have a 3-5 week lead time on materials, so we will need to gauge stock on market interest and try to stay ahead of the demand. Many of you have met us at the shows as we pedal our cool lampshades, clocks, coaster sets, wall decals and more... but make no mistake about it. We are pinheads with the same issues you have... limited parts availability! It should be noted that we are not new to making parts for the pinball industry. We have been in the background for 10 years+ printing repro back glasses, plastic sets and cabinet art on behalf of a lot of folks you all order from. We have been strictly B to B with our business approach, and for many parts that will remain. However, for The Hardtops... we will likely be customer facing (direct to the collector)by selling through our Outside Edge brand, as well as having the product available through retailers. We plan to start an additional thread in the coming weeks communicating the "ins and outs" of The Hardtop solution. It won't be for everybody... or every machine. 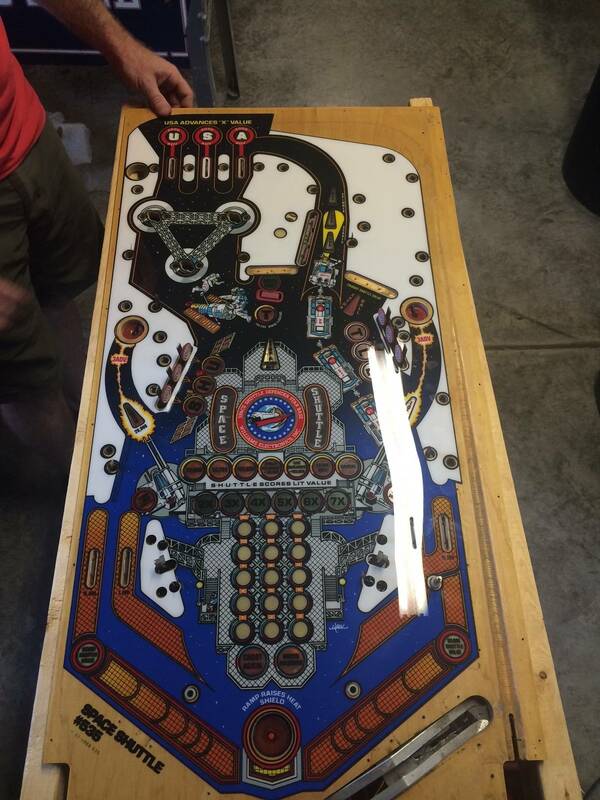 It is a permanent solution for a "beyond saving" playfield from wear and cupped inserts. More details to come! This product should never be considered for protection of the original surface, as the adhesive WILL DAMAGE the original art if removal would ever be attempted. Adam was chosen for this testing process due to his locality to Columbus, and the fact that he needed playfield help with the same title we tested for ourselves. He has done a fantastic job of logging details and keeping notes. Thanks Adam! Moving forward, more titles have been approved by PPS. We will need a stripped playield to use (in our possession). 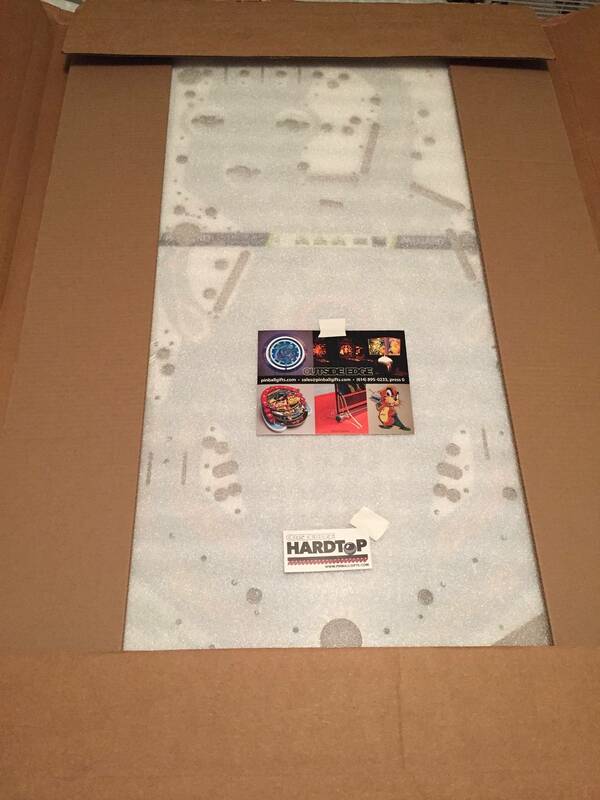 The collector will get that playfield back, with The Hardtop F.O.C. for testing and loaning us the field. We will announce those titles ONLY after we see Space Shuttle start to ship. Should this be successful, we hope to produce 8-10 NEW TITLES per year. I am working under license with PPS (and Gottlieb). 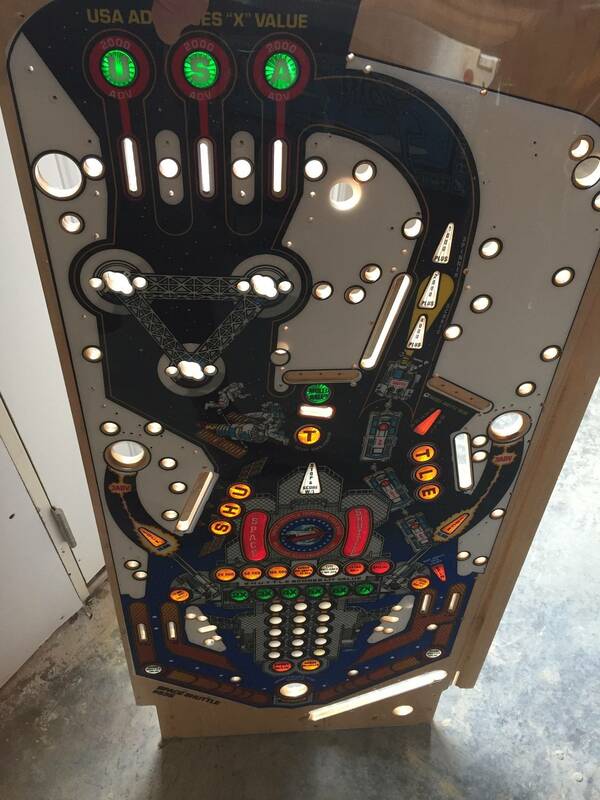 We have produced pinball reproduction parts for years. Most have never heard of us because we are not an end user facing company. We only deal with license owners of the I.P.. We have produced well over 100 projects, including back glasses, plastic sets and cabinet art. I do not post often, but our new product just may help lots of folks with titles that may never see a play field reproduced... or in this instance not "more" fields reproduced for a very long time. Descriptions above a close, only there are even better details that we hope will excite folks who need the parts! 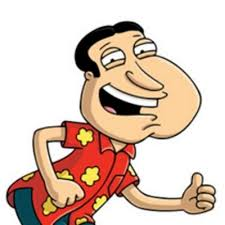 We have selected one collector already to be an "outside", non bias evaluator/beta test who needs a SS playfield. He will be remarking in January about the product and his experience with installation. We are beta testing now, and after we confirm the results and finish performance testing we will be ready to disclose our playfield solution. This will be a product that has never been available, and Space Shuttle is just the first title we are starting with. Stay tuned!. Here are a few photos of our two machines we started working on this product with. How does the product "fill" cupped inserts? With as thick as it is, it seems like there would be some airspace in there. 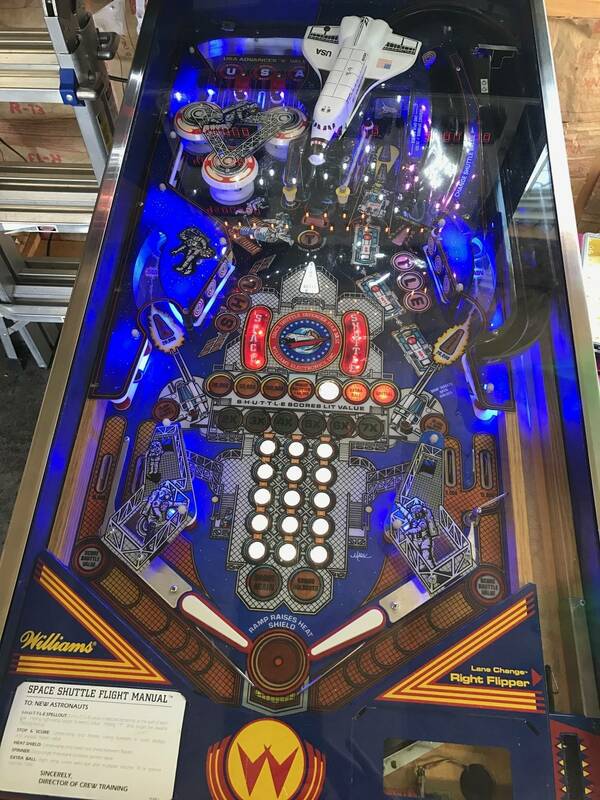 Assuming that were true, would it be better to sand the playfield clean and then relevel it by filling the inserts with urethane? That does look nice. You should offer a service to install for the not so inclined. We actually are doing the same thing with taxi. We made these essentially "playfield protectors" made from polycarbonate and printed the game art on them and just like playfield protectors they look nice and like a cleared game with protected art. It cost us about $100 (i think, dont quote me i didnt do the print work) to make plus maybe 100 hrs of art work in photoshop to make it perfect. We just made one as a test. From what I can tell, releveling the inserts may be needed depending of the "cupped factor" of a specific insert. The hardtop will allow some level of cuppage due to its rigidity. Comment23 is correct. It should be a judgement call at the restorer's discretion. We did not fill any cupped inserts on our project. We see no signs of the Hardtop cupping at this point. One has been installed for approx. 6 months so far. The substrate is quite rigid... the possibiliy of it cupping as it "bridges" slightly cupped inserts seems quite low to me. However, the one sure fire way to ensure it never does is to do just what you have suggested. Fill them first. Thanks for the tip on artists nikpinball! We are all set at this point though. We have a department that basically is dedicated to work like this... who knows though, we may need to send overflow out at some point! As you know, this is labor intensive work to match existing art ... with custom holes and shapes to boot. If you need any more testers please let me know. 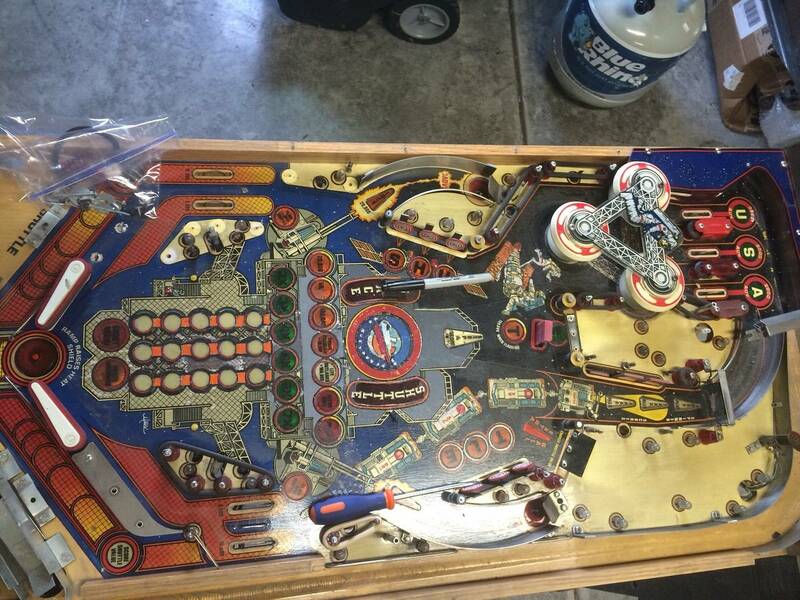 I have a completely stripped Space Shuttle playfield ready for restoration. 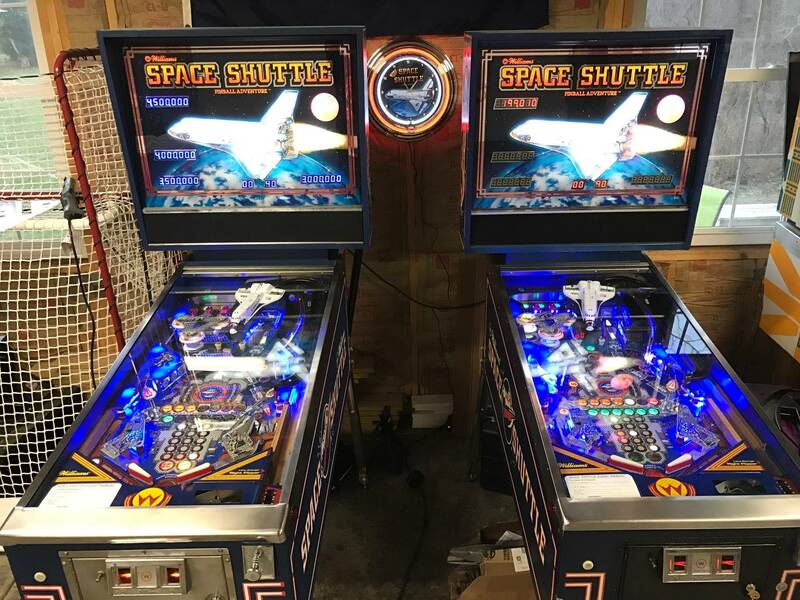 Same here, I have just recently stripped my Space Shuttle playfield but was waiting for warm weather to apply an overlay and clearcoat. Would love to test or get a prototype, or even an early run off the line. I live close in Indianapolis. I would LOVE to try this with my Taxi. The PF is pretty beat. One of the pictures of the installed looks like there are scratches. Are these in the playfield or on the glass? Second, given that this is printed on the underside of the plastic, should scratches show up, could they be buffed out? The photos are of (actually quite scratched) top glass installed.I would not spend a ton of time dissecting/zooming those images, as we have even leveled up since then in several areas. This was my own personal (internal) testing. However, it sort of shows what can be done and how it looks... so I posted. Secondly, any (like Novus products with an appropriate cloth) polish can be used. Please note though... just like clear coats, this product is not scratch PROOF... it is scratch resistant. We are currently working on administering an ATSM scratch resistance test comparing directly to a clear coated playfield. Only then will I have scientific data to show folks EXACTLY how this substrate compares to currently accepted top coating materials for playfields. It will be weeks from now, but we are working on that. No data currently exists due to the fact that scratch testing in the automotive/commercial clear coating world is dissimilar to the same type of testing done in the plastics world. So... as like almost everything... it is harder than expected to draw a correlation between my substrate and a clear coated playfield in true "scratch resistance". I am feeling very good about the custom hard coating we have found though. I will anxiously await the test results. That's awesome that you guys are going through the legwork of getting some real data on the scratch resistance of the product. Very cool!! I'll be keeping an eye on any developments! So, is this like a playing field protector, with the playing field printed on it? and does it install the same way? This looks like it has a lot of potential compared to the usual (ie terrible) overlay. Does it have to be .3" thick? I'm pretty excited about this myself. I've only seen two good overlays ... the run of Black Knight done many years ago (I think his art was used for CPR's run of Black Knight PFs) and the Funhouse overlays Phoenix Arcade did. I hear some of the Kiss and EBD overlays out there were well done, but the rest of the overlays I've seen, while better than trashed, worn out art, aren't enough for me . The hardtop has the potential to be the perfect tradeoff on price/quality/appearance ... especially for titles that have a decent following, but not enough of a voice to get good-looking new playfield artwork made (In terms of WMS games, I'm thinking of games like Flash, TriZone, Comet, etc). Plus, it seems like it wouldn't be too costly to maintain some kind of inventory (i.e. suppose they do something like Flash Gordon ... I doubt it'd be a problem to print up a new batch, make a few immediate sales, and maintain a bit of inventory for those that stumble upon a FG in the wild and want to make it look nice w/o paying a small fortune). I really hope this company gets some great data and sells a great product thereafter!!! Megadeath2600 has really nailed what our ambitions are. 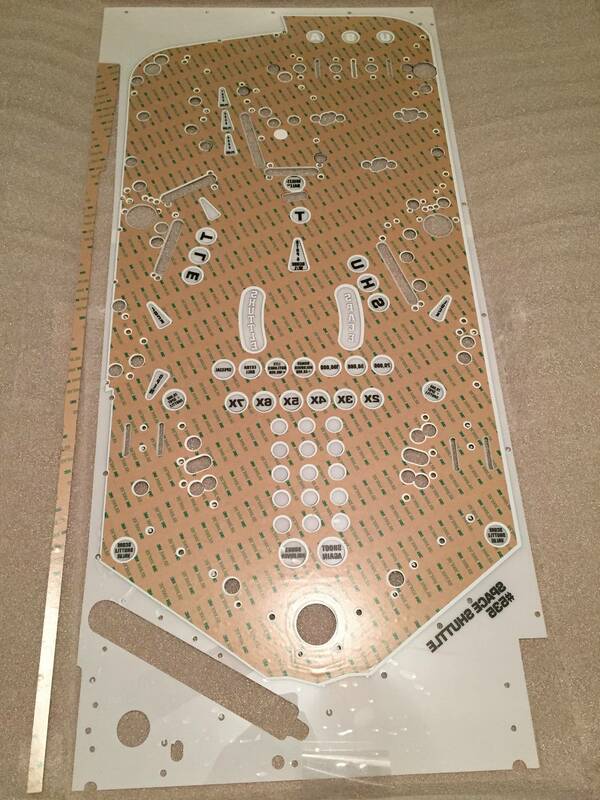 We hope this will be the product that levels up considerably from a surface printed (even if it is laminated or cleared) decal.... and far less$$$ than a full playfield swap "IF" they can be found or will ever made. We may do "a few" select newer titles in rare cases someday, but mainly we want to begin our trek toward having titles available to revive otherwise crappy, worn out playfields. The titles Megadeath2600 mentioned above are in the wheel house. We are just being cautious with this product in several ways. One is that we don't want to over state what this is.... this is NOT a new playfield. This product is NOT temporary. This is NOT something you would want to use on a field that can be restored/saved and cleared at a later date. This product is NOT scratch PROOF. While this product can solve minor dips and valleys, or cupping inserts.... it cannot level out everything. Prep will be quite important. This product IS intended to be a robust solution for a game that may get parted out because the playfield is toasted and no others can be found. This product is permanent. ( We realize we will need to clarify that soon). This product is virtually IMPERVIOUS to damage of the new art once properly installed by playing. The material is NOT an off the shelf substrate. The ball play is MUCH improved over a worn field and plays quite fast due to the hardness of the top surface. This is also a high gloss product with (at least currently) no options for finish ... like matte or satin..... gloss ONLY. In deed it does.... the special coating we are having applied is in part why... the coating company cannot go any thinner with this hardness. Secondly, part of the functionality of the product is due to it's rigidity. It eliminates small crevases by "bridging" the blemish, or cupped insert. Thinner materials would comply to them instead of bridging. You have though brought up a detail that Comment23 (my selected prototype tester who started this thread) will encounter when he reassembles. That is... all rollovers and leaf switches will need adjusted to account for the NEW .030" TALLER surface. It's really easy enough. Takes a few minutes. all rollovers and leaf switches will need adjusted to account for the NEW .030" TALLER surface. It's really easy enough. Takes a few minutes. OK, the OP said that it was .3"
Cant wait to see more info on your new product. Ohh! Ha! ... I even missed the missing "0" on the original thickness comment. It is in fact, .030" in thickness. I am beyond excited for this. If you need another beta tester for Space Shuttle...all ears. My thought was on drop targets. Thanks for clarifying the thicknesss. Thank you for actually taking the time to test your product. I will gladly wait patiently for the best possible playfield solution for our Space Shuttle. We have just finished (and shipping in a week or so) 100 Space Shuttle backglasses for PPS. They are spot on from the originals. I am guessing in late Jan. they will be available. (please note that we do not retail them... we just make them). They are doing things legitimately. Moving the PF upstairs to the garage this morning to get some sanding work done this weekend. 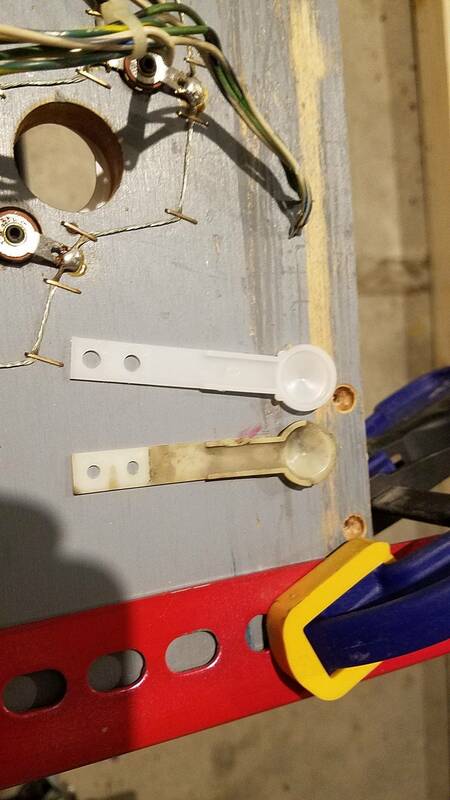 I can't seem to source the hotdog inserts so it looks like I'm going to try to repair the one I have as good as possible. That is because we took the correct approach and worked out the permission wit the rightful owner/licensing contacts of the I.P.... FIRST. PPS is in favor of this product 100%. If it all works out we will get to work making these for many titles that could not ever (or at least not anytime soon) see playfield repros. yea, I am not sure those hot dogs are around. You may email PPS (or CPR since they once ran this title)... but mine kind of stink too. It's an imperfection that I decided to live with. Yes, you are a geek. They made so many SS that when they ran out of Hotdog inserts, they switched to 3 red circle inserts in their place. Who cared? The games still made $$$$ and Williams kept the factory open. 8-10 NEW TITLES per year. This is pretty awesome. I didn't catch- is there anticipated pricing? Guessing this will be much less than a full wood repro-- but obviously more than a simple overlay. My dream is that Haunted House is scheduled. A popular title with universally trashed playfields that will never be reproduced. Future Spa, Comet, Time Warp....lots of games they made kazillions of and are always trashed. Pricing will vary depending on the titles, but think roughly half (sometimes less) of a new playfield. It all depends on manufacturing complexity and licensing variables between each game. The price for a given title will be announced as that title is released. ALL titles mentioned are approved and on the list! 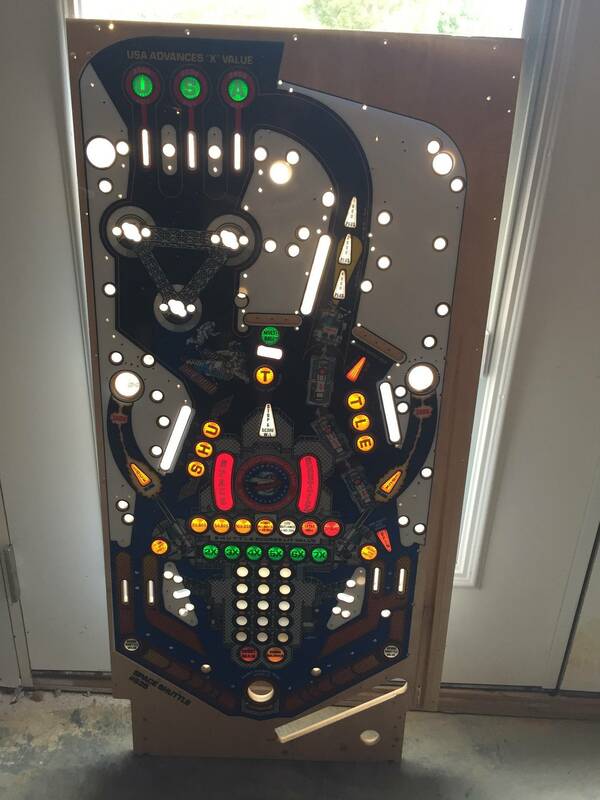 I will require a stripped, original playfield in our possession in order to design and fit. This could take several months (tops) to accomplish. 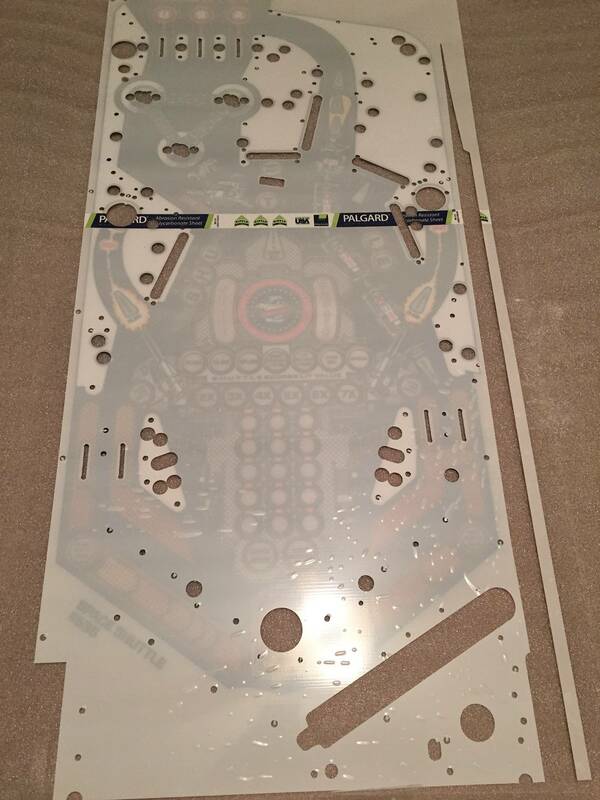 Whoever supplies the stripped playfield (with visible art.. not roached down to bare wood) will receive 1 new hardtop back with the playfield (uninstalled) when we ship back. Only one (unless a unique issue arrises) will be needed per title. Among other details, we will require a photo of the proposed field ahead of time to approve it's condition. If anyone reading is interested, please PM us for details. BTW, we will begin a new thread soon with all titles on the list soon. There are over 30 titles at this time . We need to finish up some testing first though. It is important to us that we do not over promise what we can achieve. Starting Weekend #2. 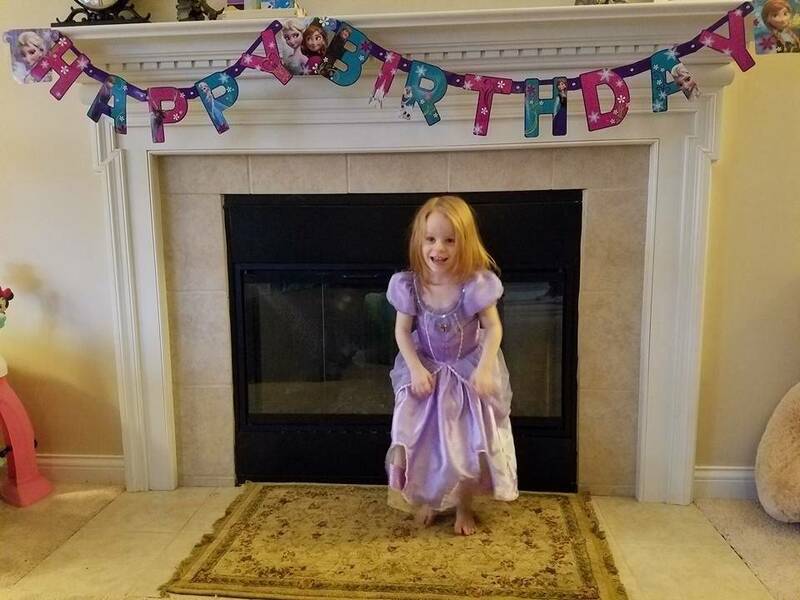 Saturday was a no work day, due to this little one's 3rd birthday! I started with 120 grit sanding pads and used circular motions in order inserts and other places where there were ridges/elevation changes. 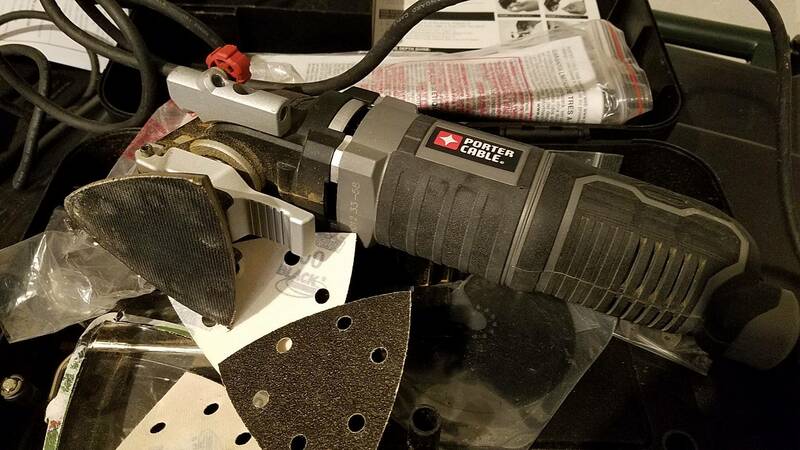 After sanding smooth, I did start to notice a dullness to all inserts. This is obviously normal as the sand paper makesthem flat. 1. Use Novus 1, Novus 2 to remove scratches. I tested this and it seemed to work well, but was a bit time consuming. 2. Use a aerosol clear product and spot spray. I used the Rustoleum (you can see the can in the video) to sport clear all inserts. This product work well for what it is, but if I wanted to put more time into the inserts, I could have done more to make them 100%. One thing to note that I did not show is that I used Naptha constantly to clean up the playfield as I went to remove any residue prior to do any work on clearing. The prep work here took about 4 hours as I did have multiple coats of clear I wanted to put down. You can also see in the video below that my mangle hotdog inserts looks better, but still far from perfect. The clear did an OK job filling in the gaps that's there. Next up the final step, application!